French carp angler Raphaël Biagini yesterday claimed to have captured the biggest common carp of the United States. A huge 24,7 kg (52,9 lb) specimen was landed recently by the fanatic European angler. 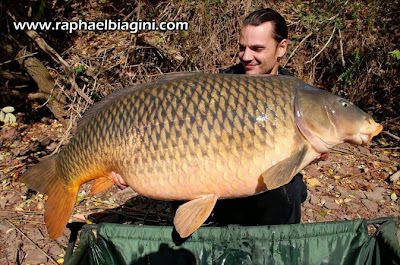 Biagini is known for many captures of big European carp, mostly in his homeland France. On his facebook page he announced Monday that he captured the biggest American carp ever at an impressive weight of 24,7 kg. 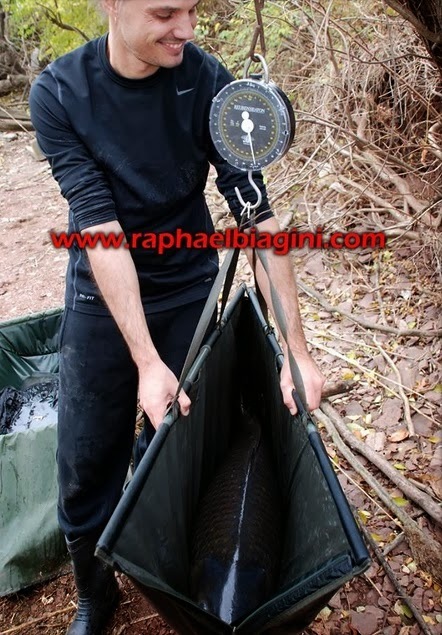 The picture on the right side shows Biagini weighing the huge common carp. When we have more details about the fish and location it was taken, we will update this article. In Europe the biggest common carp was almost twice as big as the American carp record. The world record common carp was captured earlier in 2013, and found dead three months later. 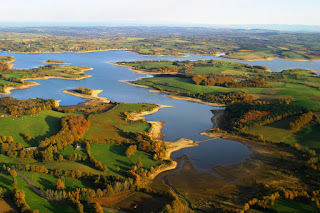 The 100lb 8oz specimen was landed at Etang de la Saussaie, a fishery in France. Unlike the United States, carp fishing in Europe is time consuming hobby for many anglers, all trying to capture bigger fish. The world record carp of 101lb 4oz currently resides in Hungary, and was captured in 2012 at fishery Euro Aqua by a Austrian angler. Update November 13th: A new picture was posted today (see below).